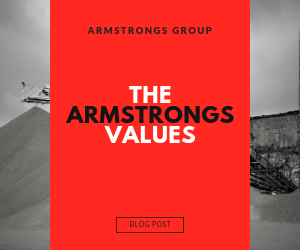 The Armstrongs Values are a set of values we life by at Armstrongs Group. They inform our decision making and influence our recruitment process. The Armstrongs values are made up of: Safety, Responsibility, Customer Focus, be team orientated, be performance driven and entrepreneurial. At Armstrongs, Health and safety plays a big part across our six sites because moving tonnes of aggregates requires heavy machinery and heavy machinery requires health and safety. As a result, Armstrongs have a wide range of health and safety protocols to protect our employees and our environments. We encourage our employees to take responsibility of their work. We want them to be proud of their work and be responsible for themselves and the safety of others at all times. For instance, giving our staff autonomy allows for them to take pride in the production of our aggregates. We have a high focus on our customer experience. From our welcoming customer service to our vast knowledge on our products and services we aim to put the customer at the heart of everything we do. As a result of this, we continuously welcome back repeat customers into our Armstrongs family. We really believe in teamwork at Armstrongs. Our teams work tirelessly for each other across our quarries, stone yard, AMIX batching plant and offices.. The Armstrongs family is exactly that, a family. With sites across Lancashire and Cumbria we value team work as our most important value. Because of this it allows us to work together to create high quality stone produce, from Ready Mix Concrete to Cut Stone, and from our quarries to our drivers. We look for all our staff to be performance driven, striving for their best efforts whilst providing high quality service and maintaining our Armstrongs high standards. We have strict quality control standards and encourage our staff to always deliver their best, for instance. We encourage everyone at Armstrongs to be entrepreneurial in their work ethic. Because of this we promote positivity and always welcome new ideas. If you think you have the values we hold so importantly and are interested in joining our team then get in touch today here. You can find a list of our current vacancies here. Follow our latest updates across our social channels on Facebook, Twitter and Instagram.